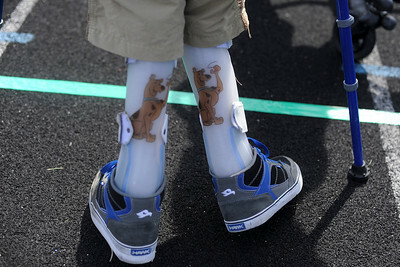 Shane Hammortree, of Marengo, gets his number readjusted by his mother, Annette, during ther 7th Run and Roll Track Meet at McKracken field in McHenry. Saturday was the first time Shane had comepted in any type of organized event. Zachary Simons,15, of Huntley, races in the 25meter dash during the 7th annual Run and Roll Track Meet at McKraken field in McHenry. Zachary Simons,15, of Huntley, races waits at the starting line before competing in a hear of the 60m dash during the 7th annual Run and Roll Track Meet at McKraken field in McHenry. Annie Schlesinger,15, of Naperville, lays in the grass after competing 1500meter run during ther 7th Run and Roll Track Meet at McKracken field in McHenry. Ben Spengel,16, of Woodstock, races to the finish line during a heat of the 60m dash during the 7th annual Run and Roll Track Meet at McKraken field in McHenry. 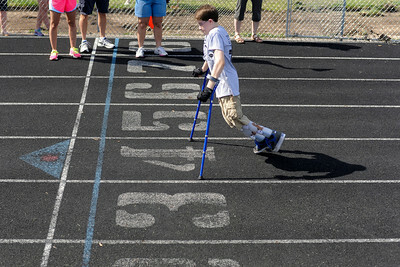 The meet was started by Spengel who wanted an event in which he and others like him could compete. The meet is also a fundraiser for Spengel's sled hockey team. Annie Schlesinger,15, of Naperville, competes in the 800 meter while fans chaeer her on during ther 7th Run and Roll Track Meet at McKracken field in McHenry. 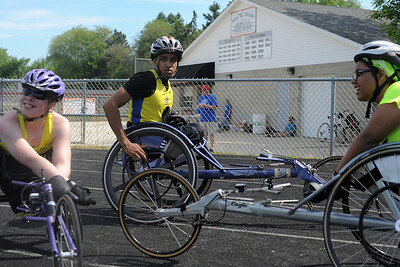 Melanie Watson, of Oconomowoc, Wis., Christan Clemmons, of Waukegan, and Serena Jaros, of Kenosha, Wis., relax after competeing in the 800m wheelchair race during the 7th annual Run and Roll at McKraken Field in McHenry. 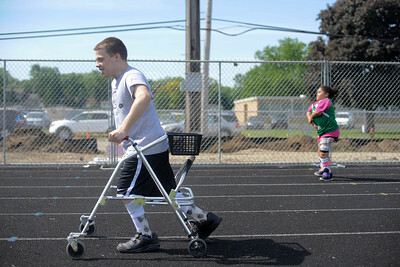 Christan Clemmons, of Waukegan, focuses before the 200m wheelchair race during the 7th annual Run and Roll at McKraken Field in McHenry.